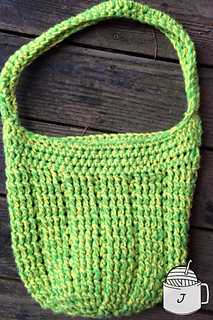 This is a great size for the beach, crochet projects, library books and more. 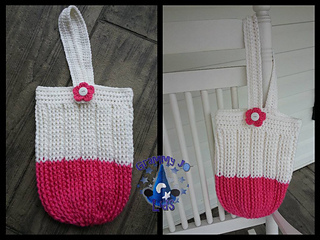 It is made with 2 strands ww yarn (or bulky weight) and a rib stitch, making it strong enough to keep up with you. Measurements: 15.5” tall by 10.5” wide measured flat. Instructions included for a variety of sizes. Thanks to Anita Mills, Jackie Benjamin, JoAnne Thompson and Stacy Dilts for the fun samples. 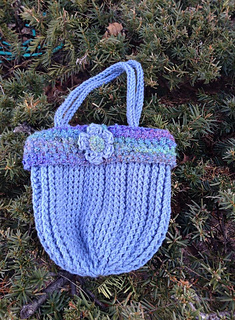 Check out the matching pocket bag. Skill level: Beginner, with basic crochet skills. Email help is available with each pattern purchase. How-to pix are included.